Odell Beckham Jr penned an emotional goodbye to New York as he left the Giants for the Cleveland Browns. 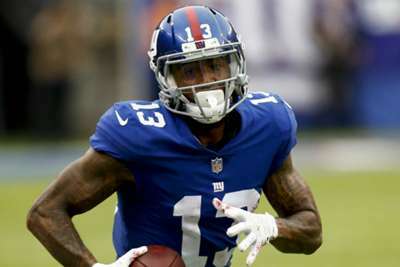 The star wide receiver spent the past five seasons with the Giants after they selected him with the 12th overall pick in the 2014 draft, but he was sent to the Browns with defensive end Olivier Vernon on Wednesday as part of a blockbuster trade. Beckham uploaded an Instagram post on Thursday thanking New York for their support and for giving him his break in the NFL. "So many mixed emotions and feelings," Beckham wrote. "This is all a lot to process but it is reality. I don't know exactly what to say so just gotta keep it real and short. "I want to thank the NY Giants organisation for giving me an opportunity to do what God put me on this earth to do. I want to thank the organisation and the owners for everything and especially giving me my first chance to be a part of the NFL. "I want thank everyone in that building from the kitchen staff to my main man Jose! I loved you guys dearly and always will. I gave you my all every Sunday. To the fans, some happy, some not, I just wanna thank you guys for making my experience in NY something I'll never forget! To the New Yorkers and real NYG fans... you guys will always have a place in my heart, a beautiful city, a beautiful place. "Thank you for every last moment and experience. Without them, I wouldn't be exactly who I am today!"